Ever heard that it’s illegal to drive with a gorilla in the backseat in Massachusetts? 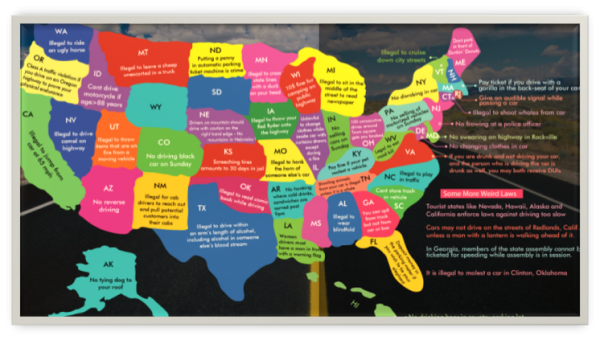 Unfortunately, that one is just an urban legend, but even so, almost every state has at least one weird traffic law that just seems crazy. Sometimes it’s because the law made sense when it came into being, but now it’s outdated, and no one has removed it from the books. Sometimes it’s because something so insane happened that a law needed to be created to prevent it happening again. To my utter devastation, most of the stories and logic behind those hilarious traffic laws remain a secret, so here’s some wild speculation about what could explain them. Alaska is a huge state, and for many years, the best mode of transportation was riding a sled pulled by a team of dogs. In modern times, we have online traffic school and cars, so dog sledding has fallen by the wayside, except sometimes as a sport or as a tourist attraction. However, when people were first transitioning from sleds to cars, perhaps there was some confusion. If a driver was leaving the house and traveling to town, how could he not take his dogs? For one, the dogs themselves would feel sad and rejected when left behind, especially if they were used to having a run every time their owner left the house. Secondly, what if the newfangled driving machine doesn’t work and breaks down in the middle of the frozen tundra? The driver would want a backup, so it’s time to pack the portable sled. However, those are large and there just isn’t that much room in a car, so where do the dogs go? Time to strap them to the roof of the car! Unfortunately, that’s not exactly safe for our canine friends. The dogs might have been having fun, but the law rightfully cracked down on their behalf. In the state of Florida, if a person leashes an alligator to a parking meter, that person is required to feed the meter as if a car was parked there. The law may sound ridiculous, but think about it. No one else is going to be able to park in that space. There’s an alligator there! If that space is occupied, it should be making the city money, so remember to bring change if you’d like to bring your pet alligator into the city in Florida. Almost anywhere in Los Angeles, at any time of the day or night, a person can log in to their Uber account and see at least five drivers nearby. Maybe there was a time when New Mexico was experiencing a similar saturation of taxis. Taxi drivers need riders to get paid, and too much competition could mean a driver won’t make rent. What’s the solution to this problem? Kidnapping, of course! Imagine the chaos of desperate cab drivers pulling potential customers into their cabs, driving them safely to their destination, then letting them go. Imagine the confusion of those passengers. Luckily, New Mexico has made it illegal for taxi drivers to physically pull potential customers off the street and into their cabs. Have you ever accidentally hit a dip in the road too fast, then heard and felt your bumper scrape the road? Did you reflexively say, “Ow!” even though it didn’t actually hurt you? That happens because drivers sometimes view their cars as extensions of their bodies. If that is true, honking another driver’s horn is a serious violation of their personal space, the equivalent of hitting them on the nose. Plus, a horn is personal to each driver. Every driver has a certain way to handle the horn. For some people, they’ll hit the horn for absolutely everything, whether it’s someone taking half a second to go at a green light or just because they’re stuck in traffic in a tunnel. Those people clearly enjoy honking their horn and might be possessive of it. At the opposite end of the spectrum are the drivers who will only honk their horns if another driver is actively endangering lives. In that case, shouldn’t we give those drivers the joy of hitting their own horns on the rare occasions when they need to? If there’s anyone out there who knows the actual reasons these laws came into being, please sound off in the comments!